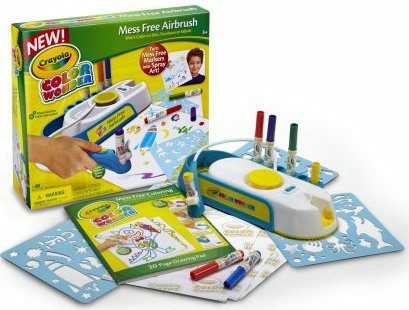 Crayola Color Wonder Mess-Free Airbrush Kit Just $5! (Was $20)! Opt for FREE store pickup or get FREE shipping on orders of $75+! Create mess-free spray art like a pro using the Crayola Color Wonder Airbrush kit. This unique product lets kids create awesome spray art designs with mess-free Color Wonder Markers. Insert a marker into the spray nozzle, aim it at Color Wonder Paper, pull the trigger and watch colors appear. The pack includes six Color Wonder Markers, three stencils and 20 sheets of Color Wonder Paper.